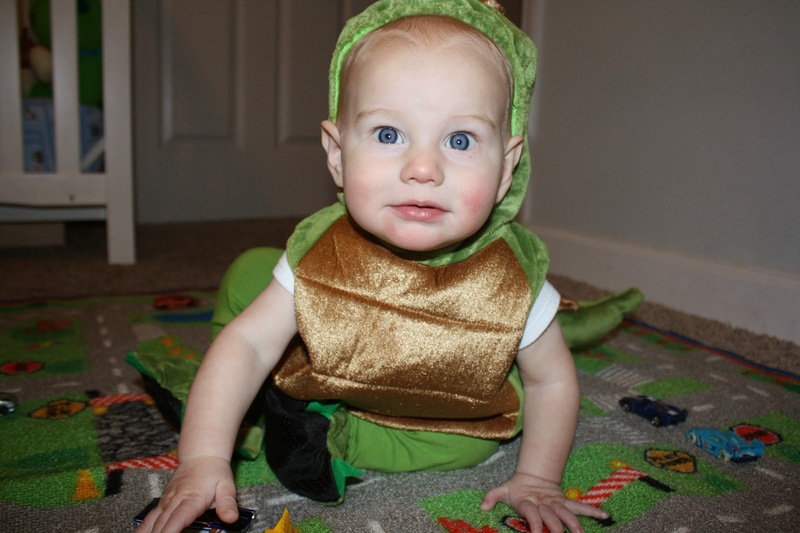 We had a great Halloween! 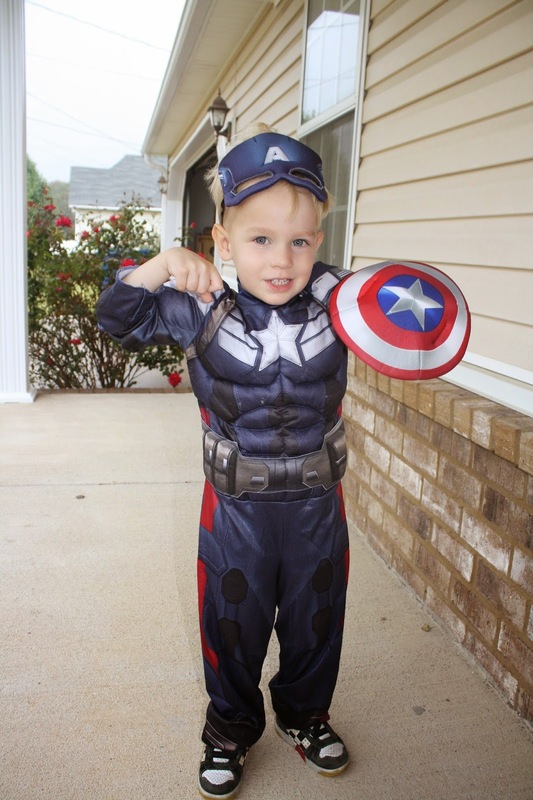 One day I would love to be that mom who goes all out makes themed family costumes. I see so many of my more creative friends who sew and craft and I'm am always so impressed. 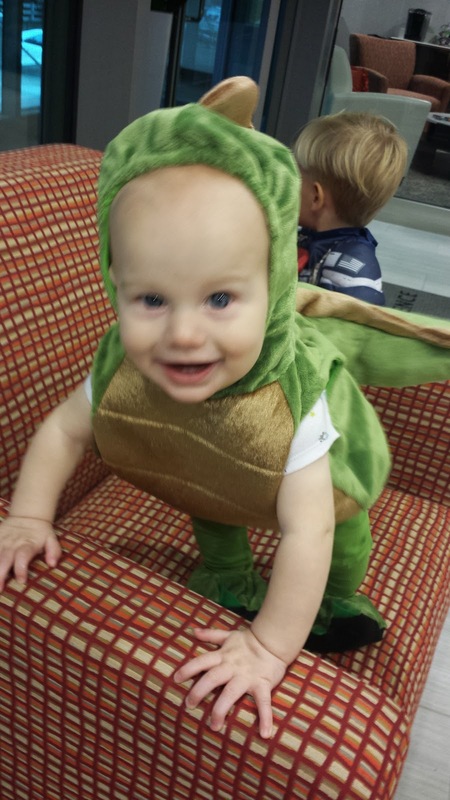 But this year, we headed to the good ol' Costco and let the kids pick out their costumes. 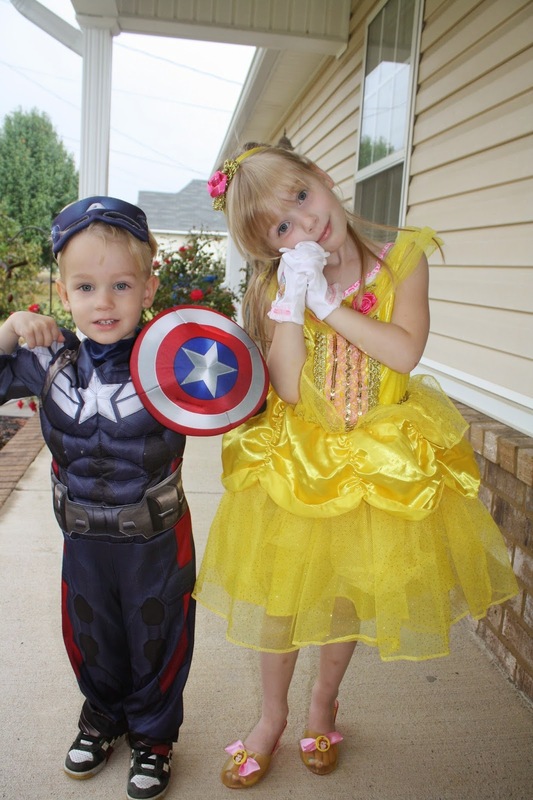 And though this year was the Elsapocolyse, Sarah took the opportunity to get a dress up dress for a princess she didn't have yet, Belle, and Cody was pumped to get a new super suit, Captain America. She kills me with this. All I told her to do was go over there and smile so I could take a picture. 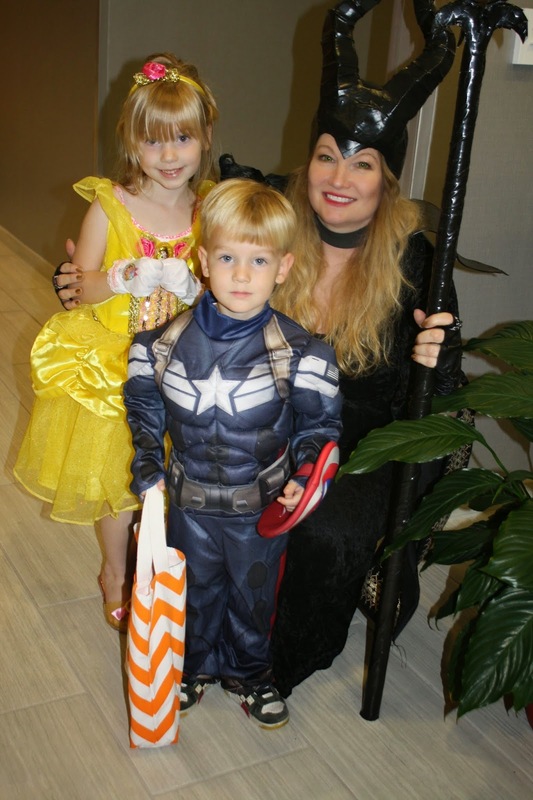 Our first Halloween Party was the Not So Haunted Halls at Wright Medical. 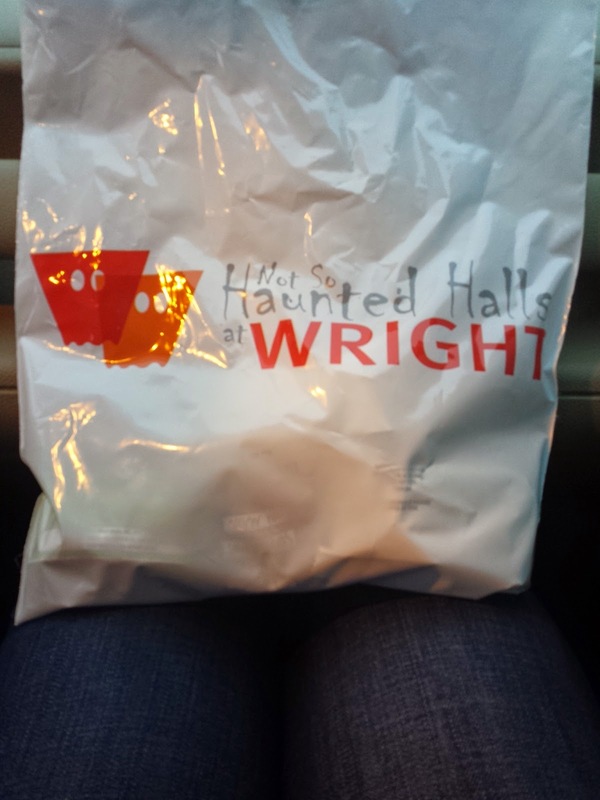 They put together some cute swag bags and even made the company logo look like ghosts. So we were able to tour Wright Medical's swanky new headquarters and see Grandpa's fancy office. And Chris was able to glad hand lots of people he use to work with. It was a really fun event for the kids and Chris. He had such a big smile being able to visit with old friends and show off the kids. And they gave out good stuff! Go go squeeze applesauce, Milanos, giant lollipops. My kids were in heaven. 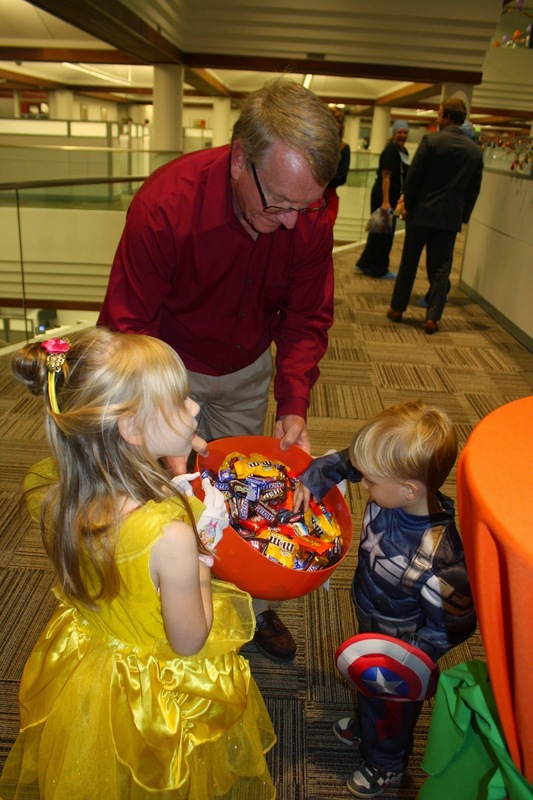 And aside from the stations there were also people in their cubicles and offices passing out candy to all the kids. Sarah and Cody had a blast. Malificient met them at the door. Darth Vadar was there too, but I didn't get a good picture. Sorry. 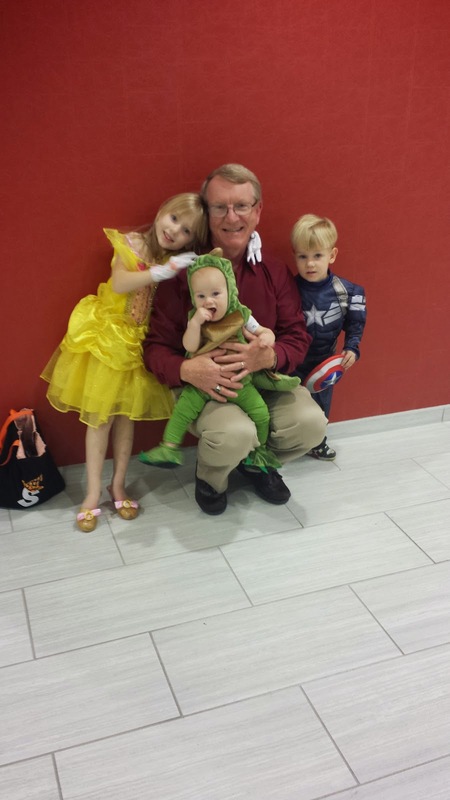 Grandpa helping the kids at one of the candy stations. 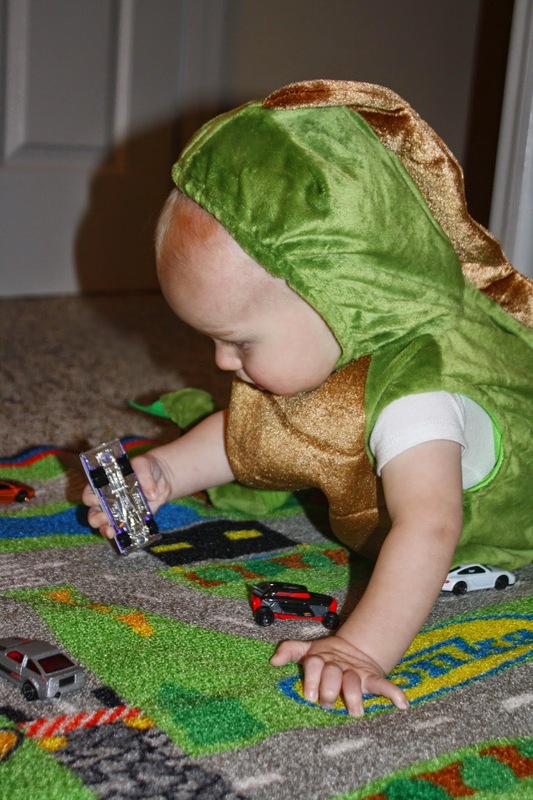 Then Wednesday we had Trunk-or-Treat at church. It was ok for us. I didn't get any pictures. We got there late because of dance class. By the time the kids were done eating their hot dogs the games were already over and being cleaned up and it was time to start trunk-or-treating. I don't think they minded missing the games but it was a bit of a bummer. 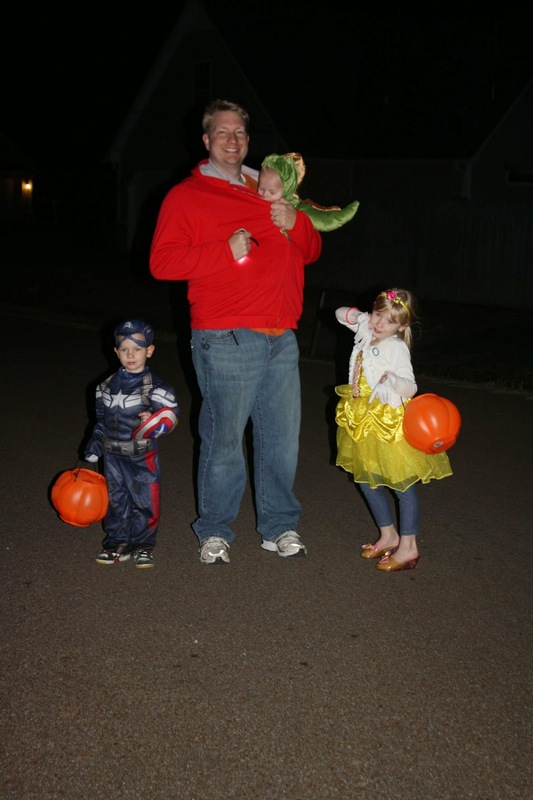 However, the got full pumpkins and a definite candy overload so they were happy. Friday was Halloween, and it was FREEZING! Oh my goodness it was cold! And windy! And cold! Did I mention it was cold? I know I've said it before, but I'll say it again. Our neighborhood is lame when it comes to Halloween, that's why last year we went out with the Combs. I thought about calling them again this year and seeing if we could crash their group, but it was too cold to want to do that. So instead we went to the whopping 4 houses that had their lights on on our street. But you, it was fine and the kids loved it because it's the friendly neighbors. So we chatted with each of them for a minute and they fawned over how cute the kids looked. Sarah was all about it leading the way from house to house. She was excited and Cody was trotting right behind her. They were perfectly content with the freezing weather. But poor Charlie was frozen! His lips were blue, his arm was pure ice. So I bribed the kids with the only thing they love more than candy, movie time. 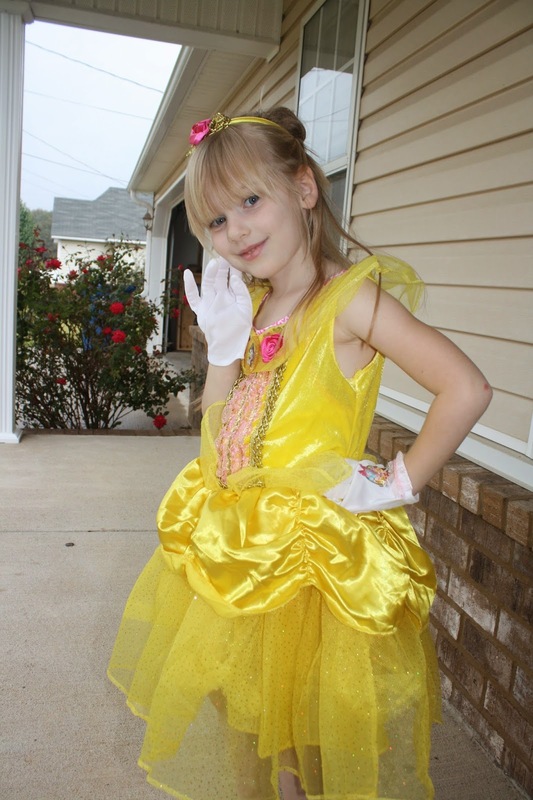 With the promise of a movie and popcorn if they were done trick or treating, Sarah turned right around and said, "yep!" and headed towards home. 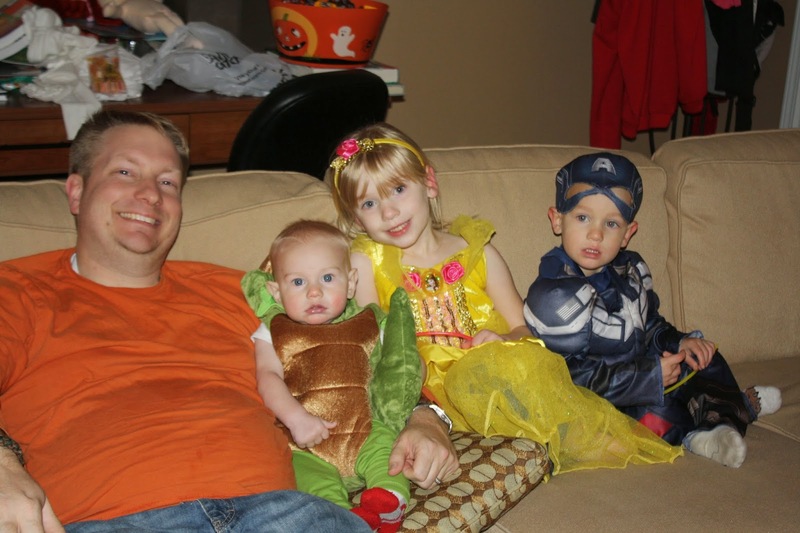 So we sat at home and watched a movie and passed out candy to the 7 groups of trick-or-treaters. 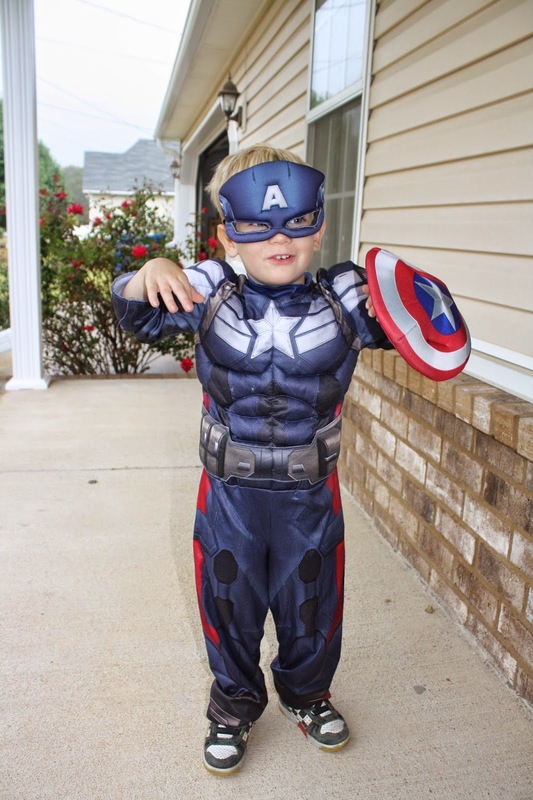 So thank goodness for Grandpa Schwartz inviting us to trick or treat at Wright, otherwise I think Halloween would have been a bust as far as it goes for the kids getting to show off their cute costumes. P.S. 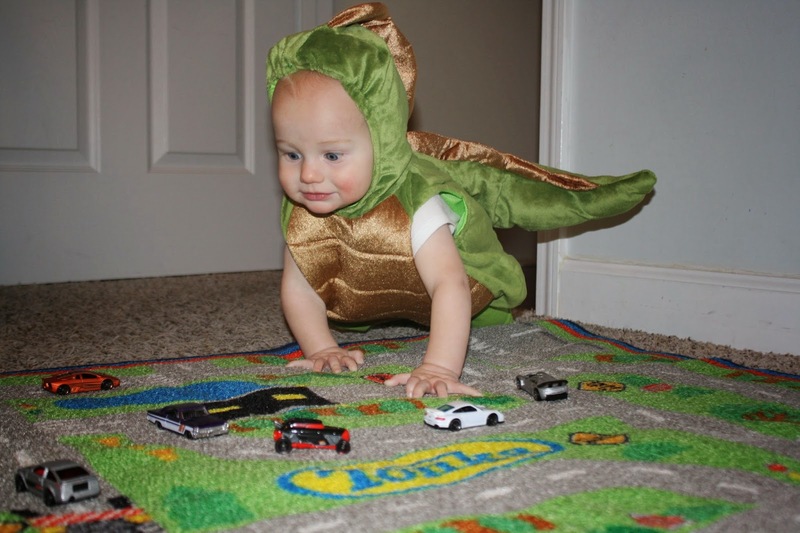 Charlie was Godzilla because he crawls now and as soon as Sarah and Cody get something set up he destroys it.